Happy Tuesday All!!!! Tuesdays means one thing and that is a fabulous technique!!!! 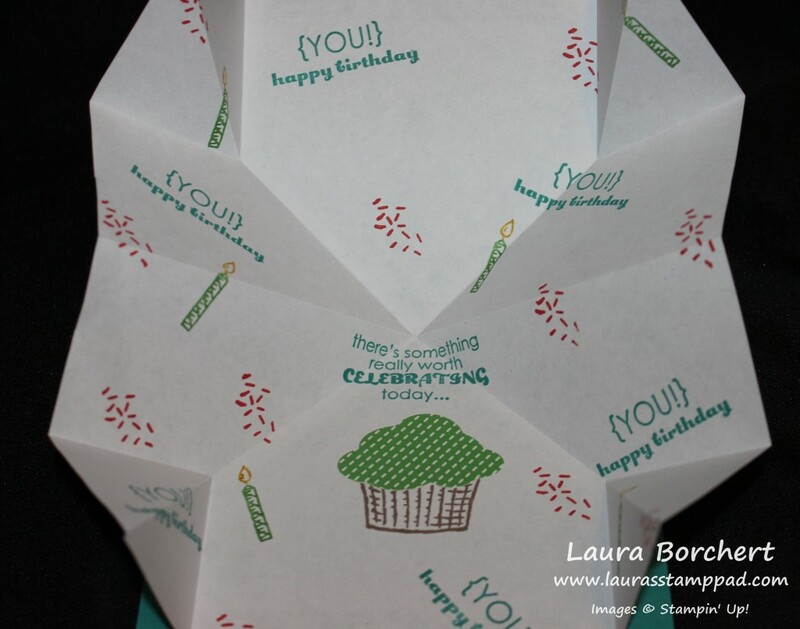 Today, I’m sharing with your this fabulous Pop Up Explosion Card Insert. It is super fun and has a 10 on the WOW scale. 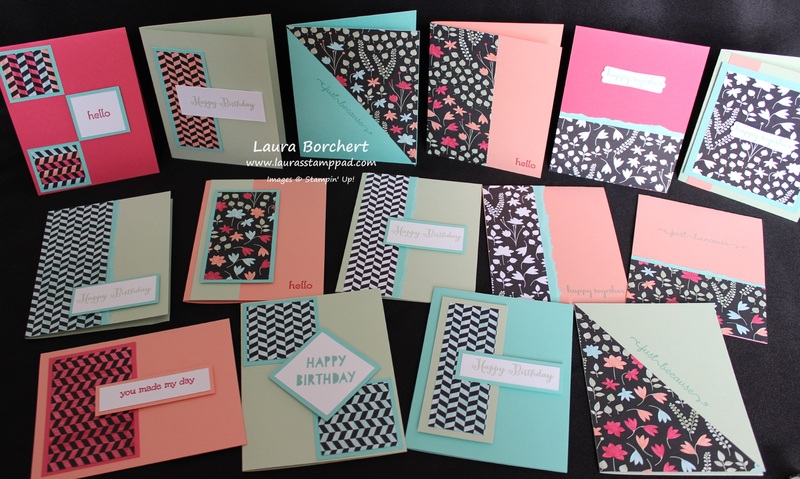 Also, it can be inserted into any card you create!!! Did you think I was going to give it all away with the first picture??? Ha, you have to wait a smidge longer! 🙂 How cute and simple is this card already though!!! 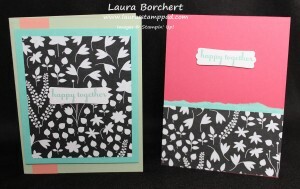 Love Sprinkles of Life Stamp Set and Cherry On Top Designer Series Paper!!!! This is rather simple once you get the folds down! (That is a big part of it. hehe) You will need a piece of 8-1/2″ x 8-1/2″ Printer Paper. If you use Whisper White cardstock it is too bulky and thick. I started out folding the piece of printer paper in half so that I would know where the middle was. Be sure when you fold it that you are use a bone folder for a nice strong crease and it will fold and unfold much better this way. Now that you know where your center is, you can start stamping all over……like this!!!! See how fabulous that is!!!! You totally have to watch the video below to see it in action! It is amazing!!! 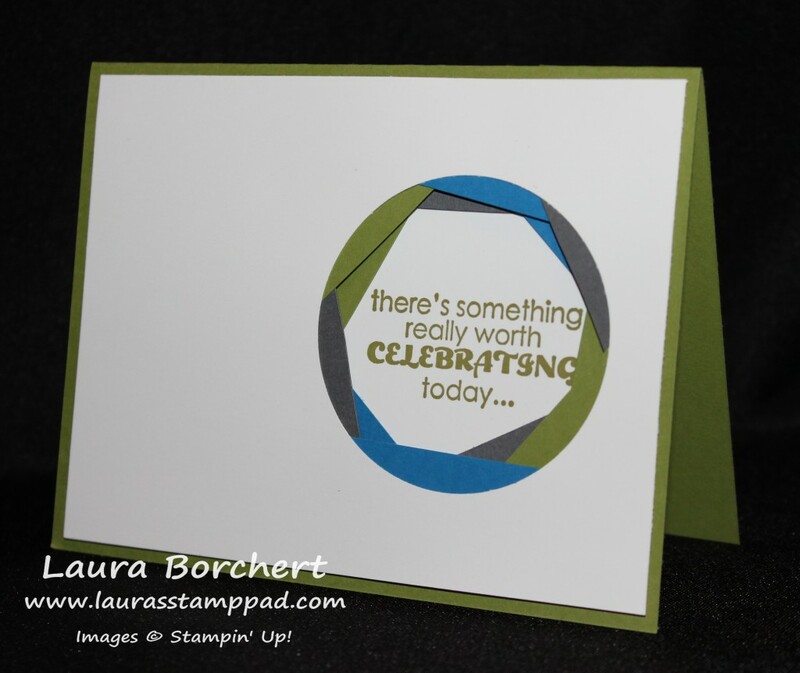 You can see my center line right above the greeting “there’s something really worth celebrating today…” I wanted that line so I knew to stamp that greeting either right above or right below for the center. That is the only fold that I did in the beginning because it is much harder to stamp on folded paper than flat. So I stamped the greetings from the Remembering Your Birthday Stamp Set and the candles, confetti, and cupcake from the Sprinkles of Life Stamp Set!!! Once you have decorated, it is time to do the rest of the folds. Fold it in half diagonal corner to corner both ways so that it creates an “X” on your paper. So now you should have a line across the middle and an X. So now, fold it in half diagonal on the line you created to make a triangle. Fold it again on the other diagonal line, making it into a smaller triangle. 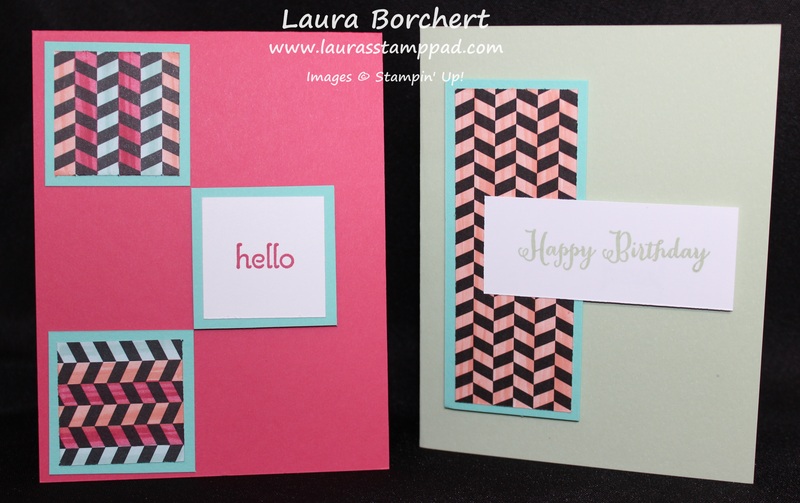 Now with your triangle, you will fold in both ends that have the open sides (not folding the tip that is all folds but the other 2 that have openings so you can see your stamped images). I hope that makes sense…..that is why I created a Video Tutorial. 🙂 Fold the 2 sides into the middle, be sure to use your Bone Folder for those nice strong creases. Now unfold it all and it’s time to make it into the explosion piece. You are done making new folds. Fold it in half on your line, pop in the large triangle sides. Then you will pop in the 4 little triangles as well. Now you are all done and it is time to insert it into any card!!! I used Fast Fuse for a strong hold but I’m pretty sure that Snail would work as well! Add adhesive all along the edges, peak in to see if you added it to the top or bottom so you are inserting it into your card correctly. Then lay it in your card, adhesive side up, be sure to line it up with the edge of the card and centered. The point of the insert should be in the crease of the card. Once it is all lined up, close the card, pressing on that adhesive. Now flip it over, add adhesive to the other side and again, close the card to seal it. You are all done and can decorate the front of your card as well! For the front, I used the Cherry On Top Designer Series Paper Stack and then added another cupcake from the Sprinkles of Life Stamp Set! Now for what you have been waiting for……the Video Tutorial. 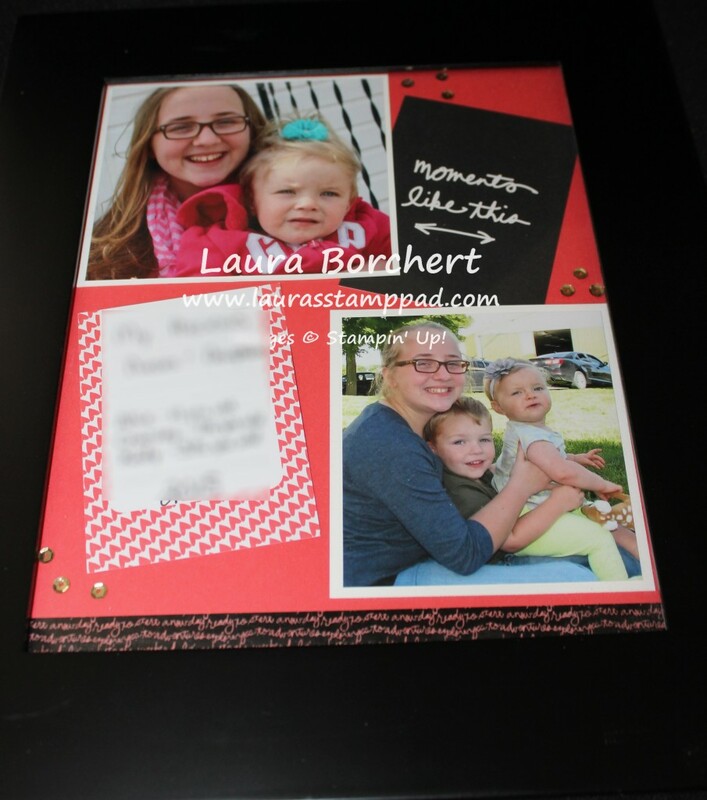 I hope it helps you create this amazing insert because it is really fairly easy (just hard to write out). Let me know if you have any questions and feel free to share your creations. I would love to see them!!! Don’t forget to give the video a thumbs up if you liked it! Technique Tuesday – Baby Wipe Technique!!! Happy Tuesday!!! You know what that means….I have a fabulous technique to share with you today! This is an oldy but a goody! It is so much fun and super simple too! The look comes out different each time but it is really fabulous! Amazing shades of pink and I’m in heaven!!!! Love love love it!!!! Now let’s get started!!! This is a really simple technique. You just take your baby wipe and fold it up. 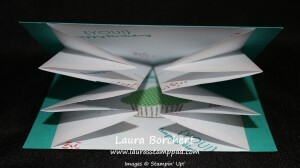 For this I folded it into quarters but if you are using a larger stamp, then you can fold it in half. Be sure it is at least 2 layers thick. If you are using a large stamp, just layer 2 wipes. Place them on a plate, plastic container, or clear block stamp case like I did!!! Then using your Re-Inkers you will squeeze dots all around in Melon Mambo and Pink Pirouette! I went with the lightest and darkest pinks for a strong contrast but you could use any colors you use! Now the baby wipe is your ink pad. It is as simple as that! 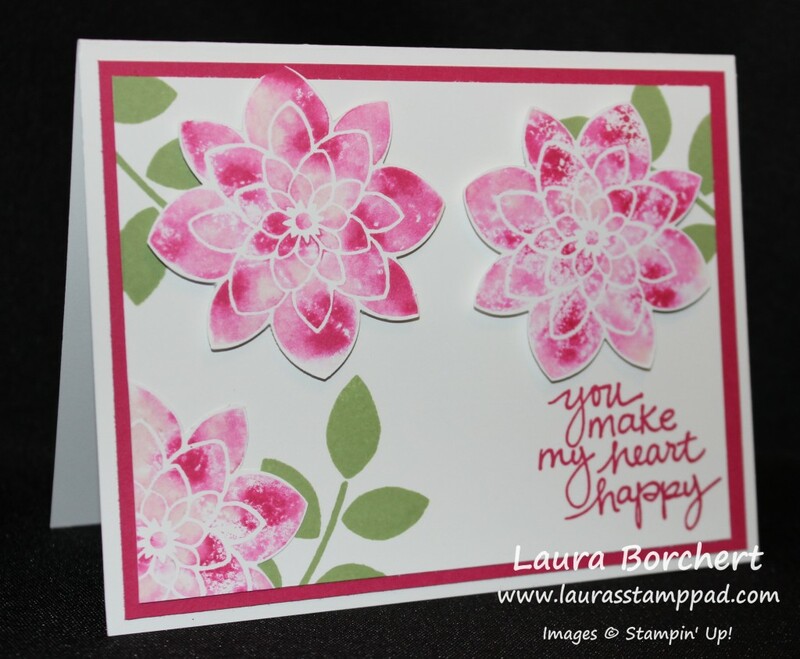 Then I took the flower from the Crazy About You Stamp Set and used my new baby wipe ink pad to stamp flowers all over scrap Whisper White cardstock. Then I punched them out with the coordinating Flower Medallion Punch so that I could use them on my card. 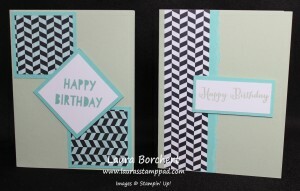 For my card, I have a Whisper White base (5-1/2″ x 5-1/2″) with Melon Mambo (5-1/4″ x 4″) on top! 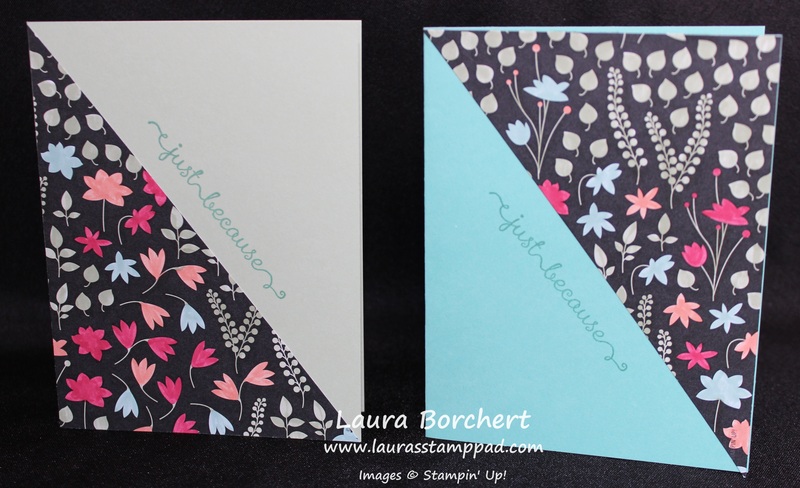 With another Whisper White piece measuring 3-3/4″ x 5″, I stamped the leaves from the Crazy About You Stamp Set in Wild Wasabi and added my greeting in Melon Mambo from the Lovely Amazing You Stamp Set! Now it is time to add your flowers! I placed one in the corner with Snail adhesive and trimmed off the excess. 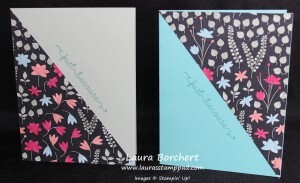 For the other 2 flowers, I added those with Stampin’ Dimensionals!!!! You know how I love those things!!! Beautiful!!! I just love it! I really think that purple would be fabulous too – really any color would be amazing! Here is another one that I created! For this card, I used Tempting Turquoise, Elegant Eggplant, and Daffodil Delight Re-Inkers on the Baby Wipe. I just placed drops all over the place. They bleed together and created that beauiful green! This is just a really fun technique! 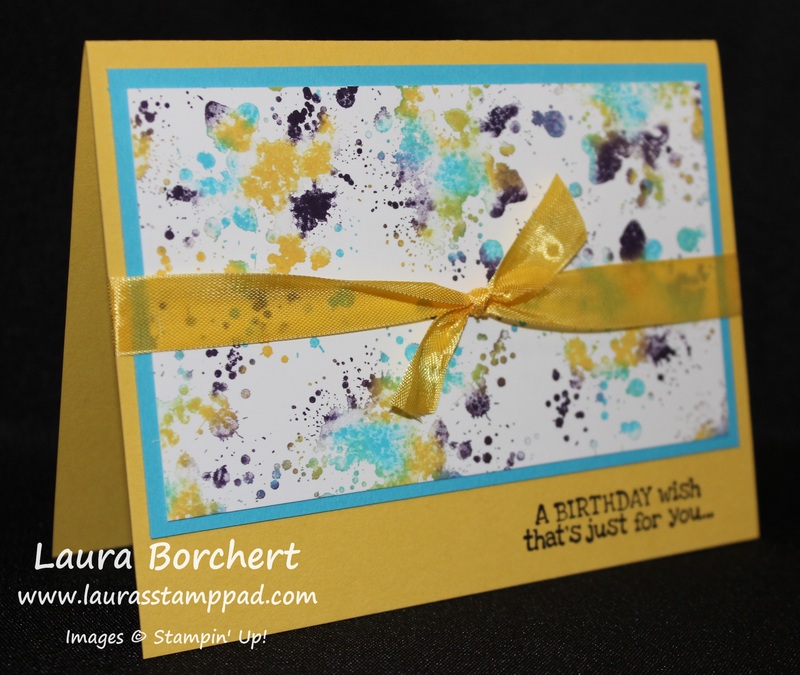 For this card, I used the Gorgeous Grunge Stamp Set and just stamped all over a piece of Whisper White cardstock (3″ x 5″). 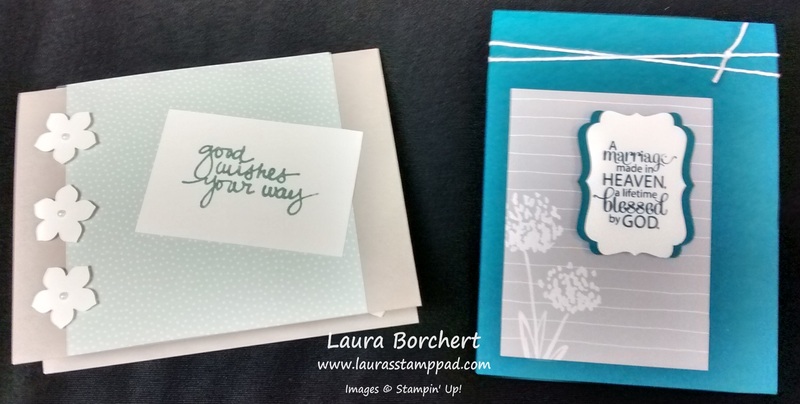 I layered that onto a piece of Tempting Turquoise (3-1/4″ x 5-1/4″) and added it to my card base of Daffodil Delight! I added some Daffodil Delight Seam Binding around the card and stamped the greeting at the bottom. 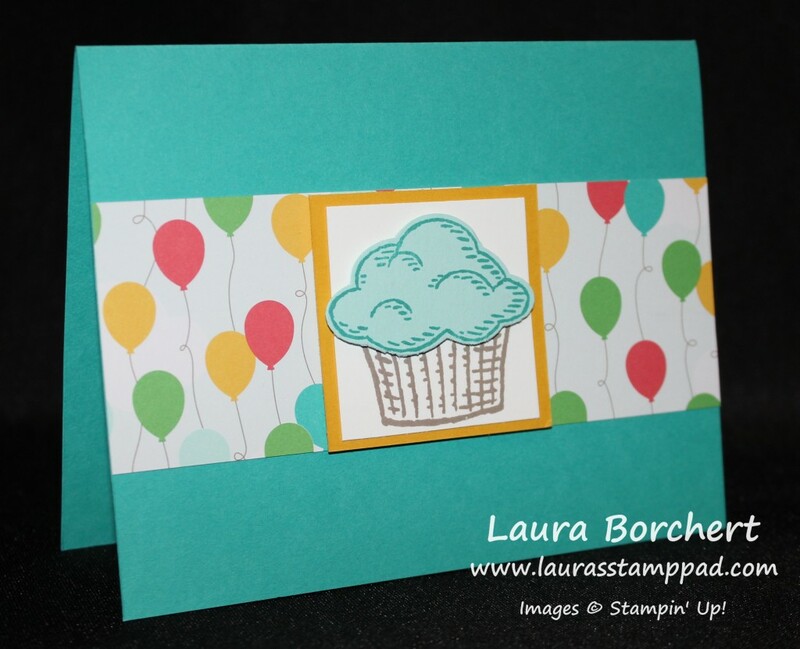 This greeting is from the Remembering Your Birthday Stamp Set so the coordinating greeting is stamped on the inside! 🙂 I think this card scream Teens or Tweens. It’s like rockstar, punk rock looking…..or something? Am I alone here? Let me know in the comments below!!! Also, I created a Video Tutorial for you on this cool technique and a few tips and tricks! Don’t forget to give it a thumbs up if you liked it!!! Quick and Simple Man Card!!! You can check out more samples (Girly Ones) using the All Abloom Designer Series Paper Stack here, here and here! 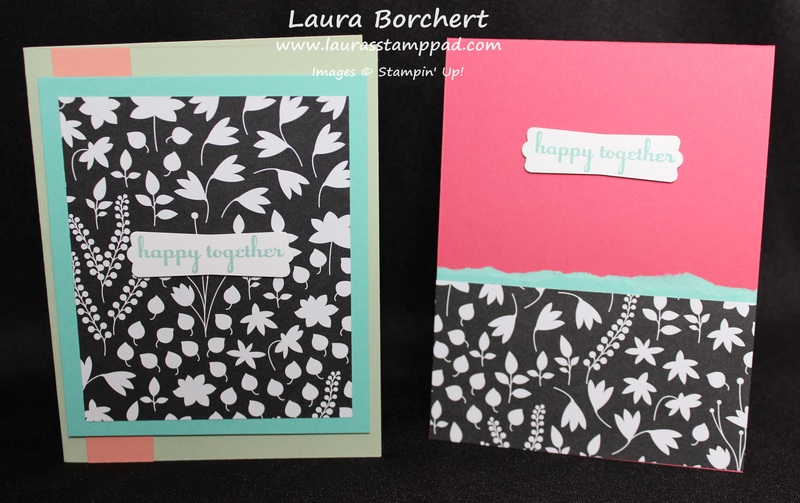 I love how you can create a forest look with the Sheltering Tree Stamp Set from the Occasions Mini Catalog! I do wish I did more Spring colors rather than Fall but either way it is super fabulous! 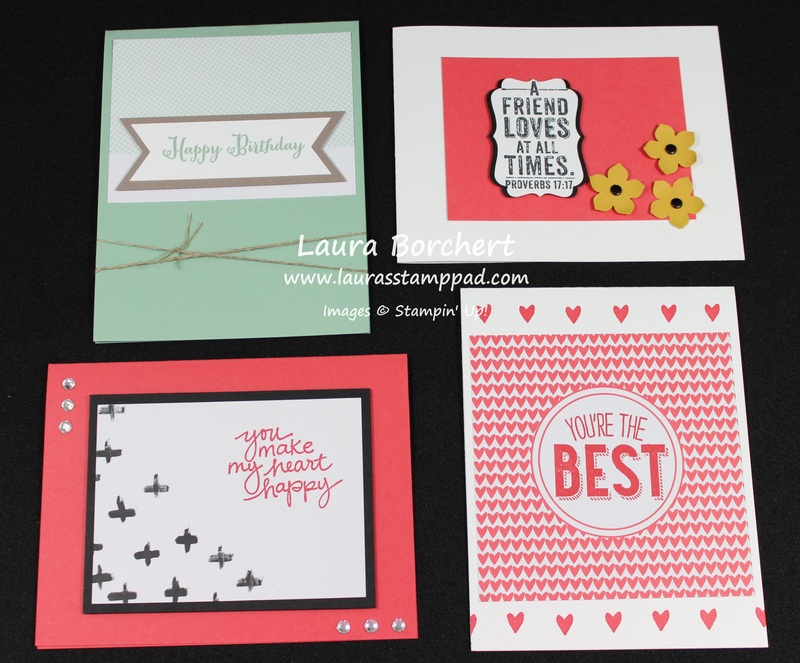 I have a card base of Rose Red (4-1/4″ x 11″), with Mossy Meadow layered (4″ x 5-1/4″), and then Whisper White (3-3/4″ x 5″)! My trees were stamped in Chocolate Chip and a few of them are full strength and some are stamped off. For the leaves, I used Rose Red, Mossy Meadow, Cajun Craze, and Crushed Curry! Some of them are full strength and some are stamped off. I stamped right to left, up the left and around to the right along the top. Love it!!! Spring colors….hmmm those would be like Wild Wasabi or Pear Pizzazz and then some Strawberry Slush, Rose Red, Crushed Curry. I think that would look amazing as well! I love it! The greeting is from the Remembering Your Birthday Stamp Set! Quick and Simple!!! 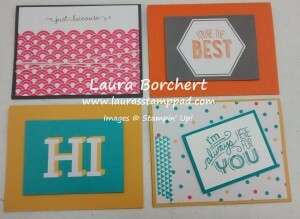 To see more samples using this stamp set, check out this post and this post! Technique Tuesday – Iris Fold!!! Happy Tuesday!!! You know what that means….I have a fabulous technique to share with you today!!! I love this one because it creates an amazing look AND it uses little scraps (who doesn’t have millions of those laying around)!!!! Need a third reason to create this card? It makes a great Man Card!!!! Now lets get started on how I created this!!!! 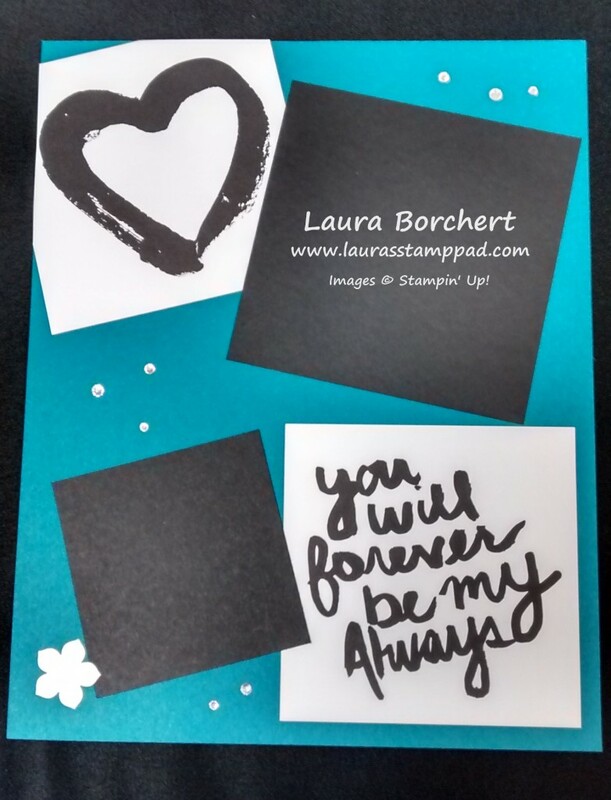 You will start with a piece of Whisper White cardstock measuring 4″ x 5-1/4″ and using your 2-1/2″ Circle Punch push it all the way in on right side and center it top to bottom and punch!!! Now apply Snail or Fast Fuse around the circle and start laying your strips of cardstock down. 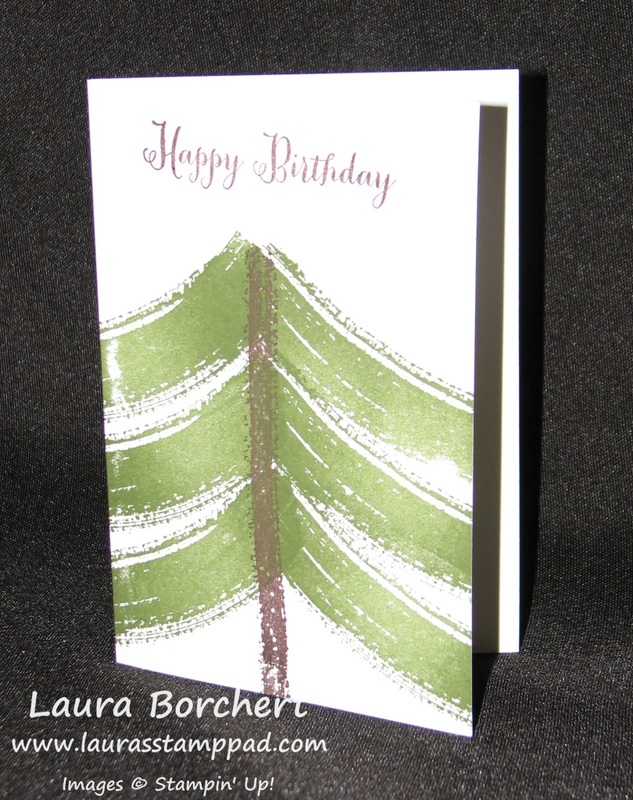 I used Pacific Point, Old Olive, and Basic Gray in the card above. 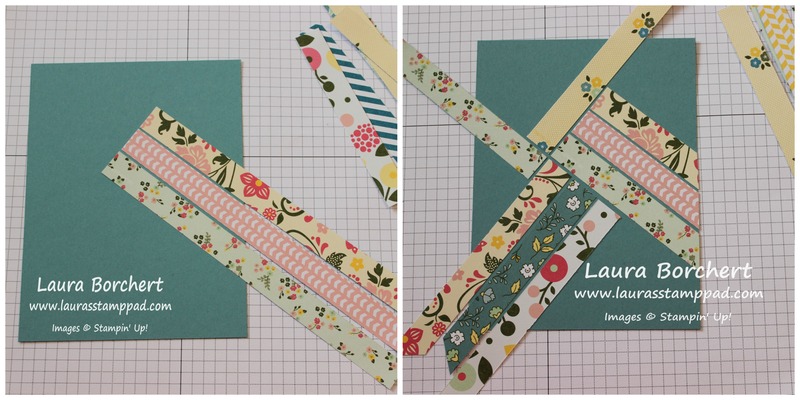 The strips are about 2 inches long (or less) and maybe a 1/4″ wide. Again you can use any type of scrap because no one is going to see the back and you will just lay one down and then the next color and the next. You can do them close together or farther part just be sure that the strip crosses over the other color and that you can’t see light between the strip and the punched circle. 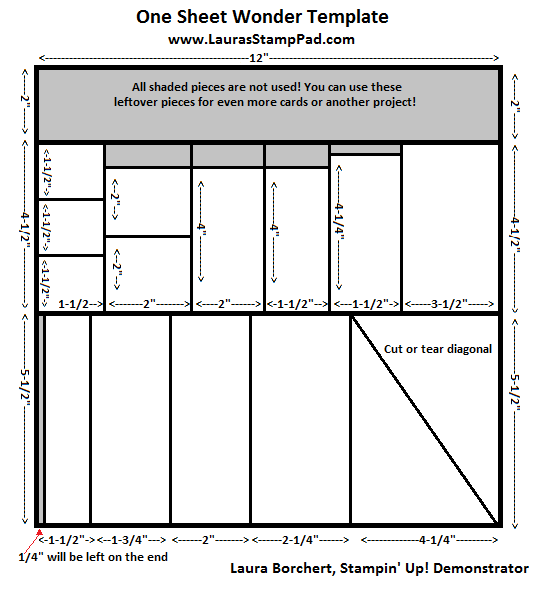 Once you have done the first layer, you will add Stampin’ Dimensionals at each cross section and then start in with the second layer. 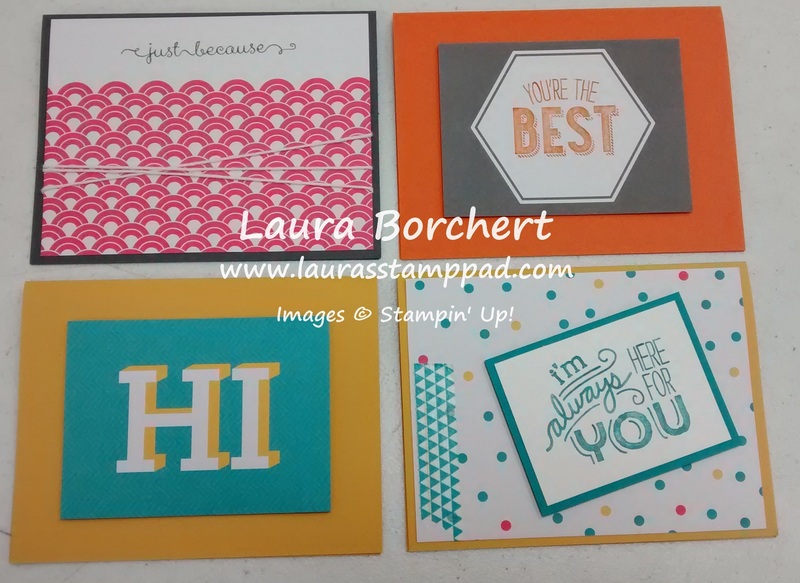 If you need to add in more Stampin Dimensionals, that’s no problem and if you end up not using on that was already placed down, no worries there either. It will help with adhering this piece to your card front! Once you have completed the second round, you are all done!!! At this point you can add ribbon or stamping or any embellishments to the left hand side or leave it black like mine above. 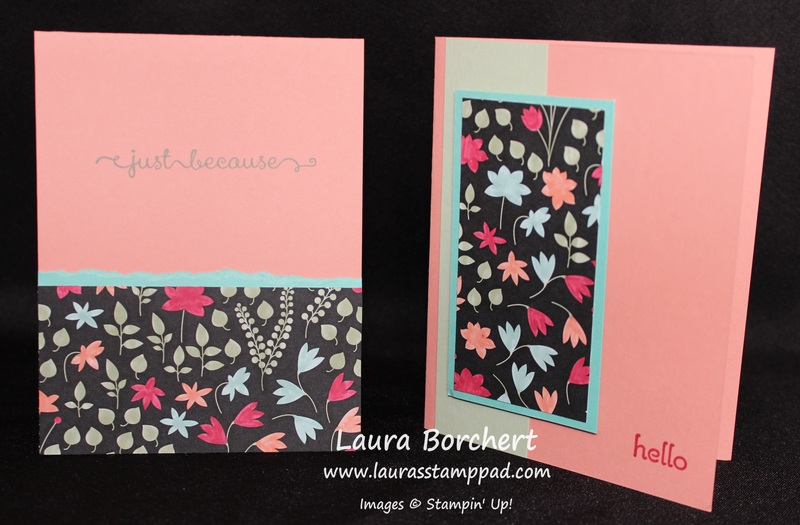 Add a few more Stampin’ Dimensionals to the corners and attach it to your card base (I used Old Olive above)! After that piece is in place, you will stamp your greeting. Be sure the greeting is going to fit in the hole. The greeting used above was from Remembering Your Birthday and the coordinating greeting is stamped on the inside! Love it! Simple, quick, Man Card and uses up those scraps!!! Here is another sample using Calypso Coral, Crisp Cantaloupe and Pink Pirouette. 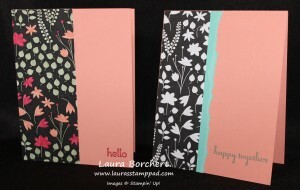 I added in some Calypso Coral Seam Binding and the greeting is from Simply Wonderful which is a free Sale-A-Bration item! You can still earn this stamp set for FREE with a $50 (US) order placed through the end of this month! 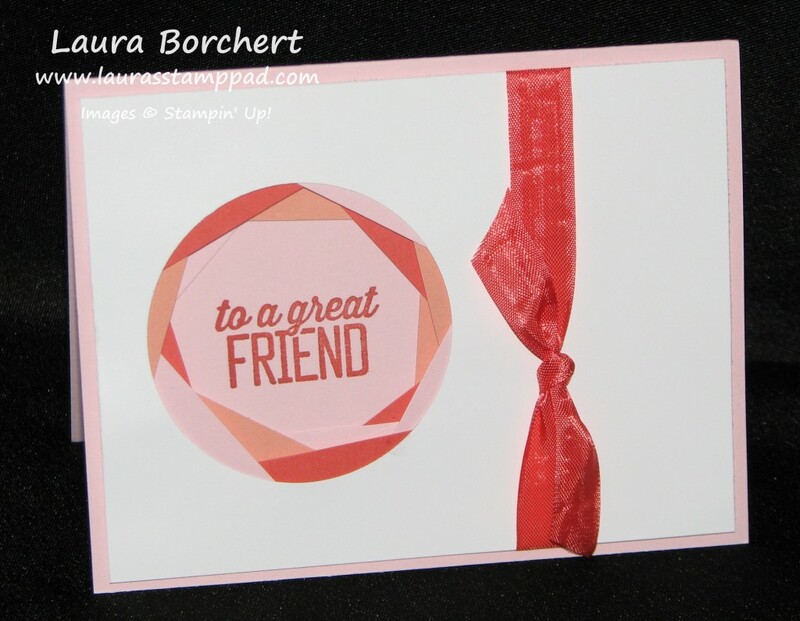 Shop here and you will also earn points as a Laura’s Loyal Stamper!!!! Want to see this Technique in action??? Check out my video tutorial below and don’t forget to give it a thumbs up if you like it!!! I still can’t put down my Work of Art Stamp Set and have created some new ones!!!! You can check out some others here, here and here! This will be broken down into a few posts because there are just so many amazing ones! Be sure to check back again next Monday OR you can subscribe in the upper right corner and then you will never miss a post! How fabulous is the bunch of grapes??? This would make a super cute card for a Hostess when you bring a bottle of wine or for someone’s Birthday who enjoys wine as well!!!! I used Pear Pizzazz and the small swish for the stem. 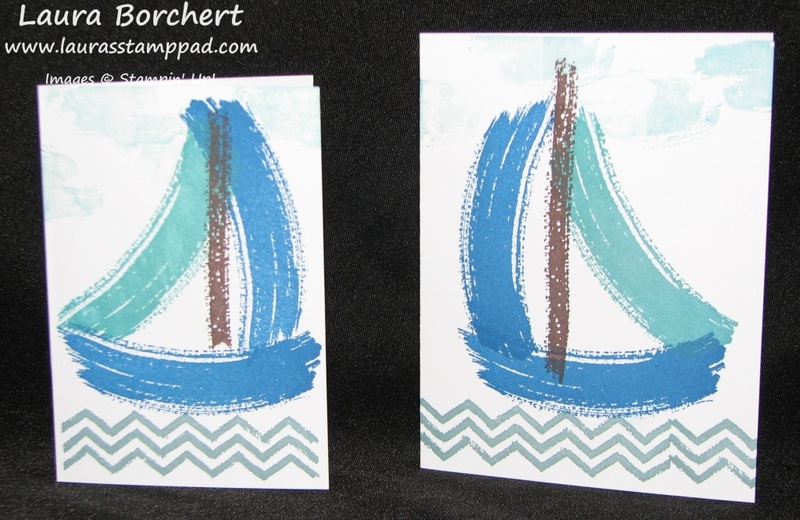 I stamped twice in full ink and then up a little with the stamped off image. For the grapes I used Blackberry Bliss and stamped about 5 times before going back to the ink! Love it! Adorable and perfect for a little boy’s birthday or baby shower!!!!! This sailboat uses lots of blues! I used the chevron image in Lost Lagoon for the water. Then I took the large swoop and used Pacific Point to make the bottom and side sail. The second sail was stamped in Bermuda Bay. Lastly I added the mast in Chocolate Chip. You may want to lay a piece of scrap paper down in you wish to have a shorter mast like the one on the left! The clouds were created with the small swoosh and stamped off Bermuda Bay! This tree is quick and simple. I used Chocolate Chip and the long piece for the trunk of the tree. Then with Mossy Meadow and the large swoosh upside down you will stamp them angled down for the branches. 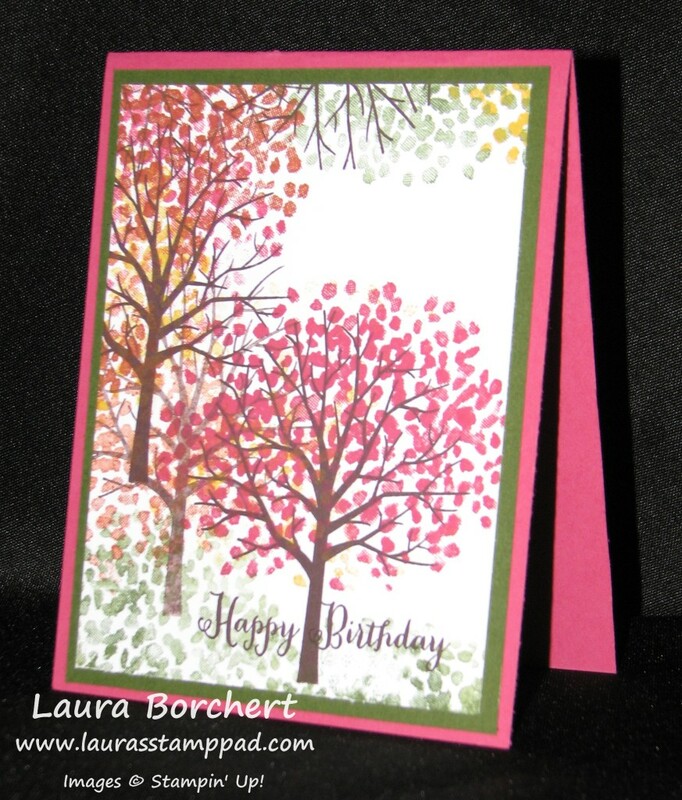 I’m done with my Christmas Cards so I added a Birthday greeting from Remembering Your Birthday but this would look amazing with a star on top and Cherry Cobbler Dazzling Details as ornaments. So many options! I love it! Want to see this in action? Check out this Video Tutorial! Which one is your favorite?? Leave me a comment down below and don’t forget to check back on Monday for more! Happy Tuesday!!!! That means that I have a fabulous technique to share with you and I LOVE LOVE LOVE this one! Lots of bling and you can pick whatever color you want!!!! I love love love Silver and BLING….add in a pop of color and it screams my name!!!! Start off with a card base of 4-1/4″ x 11″ in Whisper White and adhere a piece of Silver Fancy Foil Designer Vellum on top measuring 4″ x 5-1/4″. Vellum can be tricky to adhere because you can see where the adhesive is since it is partially clear. With this card, you don’t have to worry about your adhesive because it is covered by the Whisper White decorative piece. 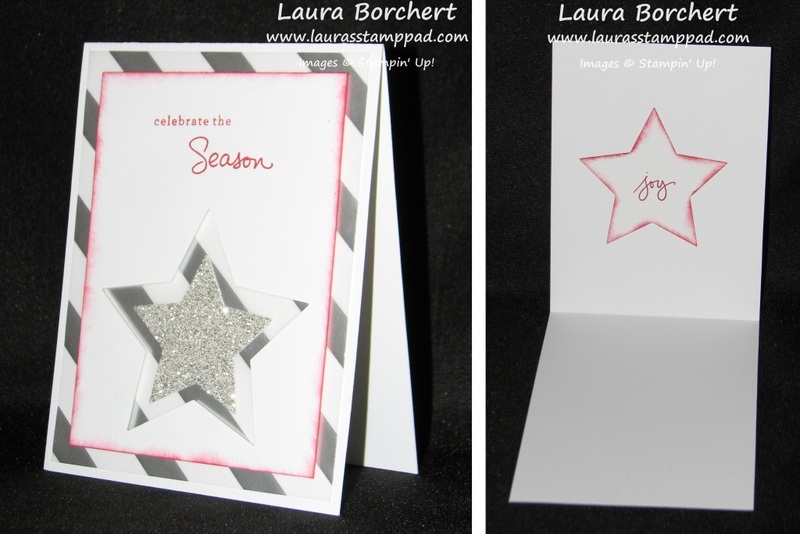 Then using a piece of Whisper White cardstock measuring 3-1/2 x 4-3/4″, you will place the third largest star from the Star Framelits on the bottom half and run it through your Big Shot! Now using your Sponge Daubers, brush the edges of the white rectangle and the punched out star! 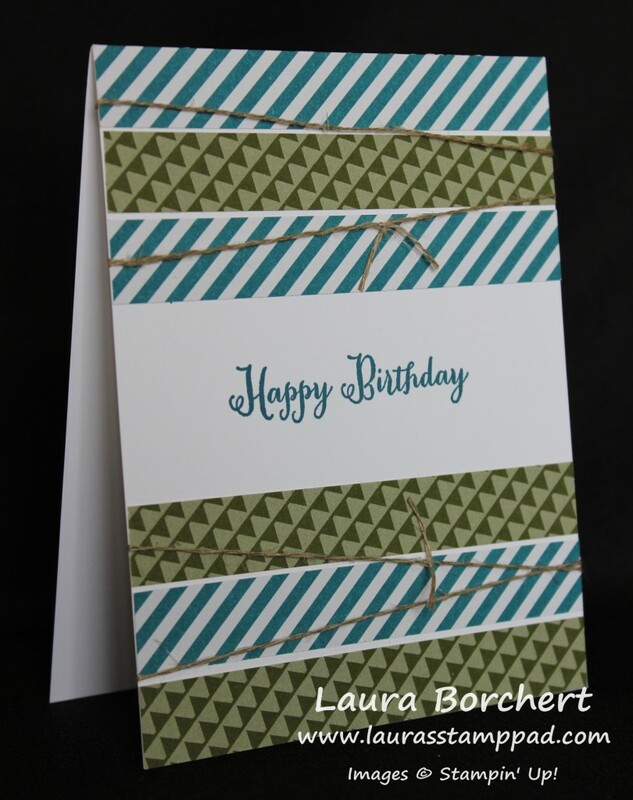 You can use the star on the inside of your card or for a completely different project! 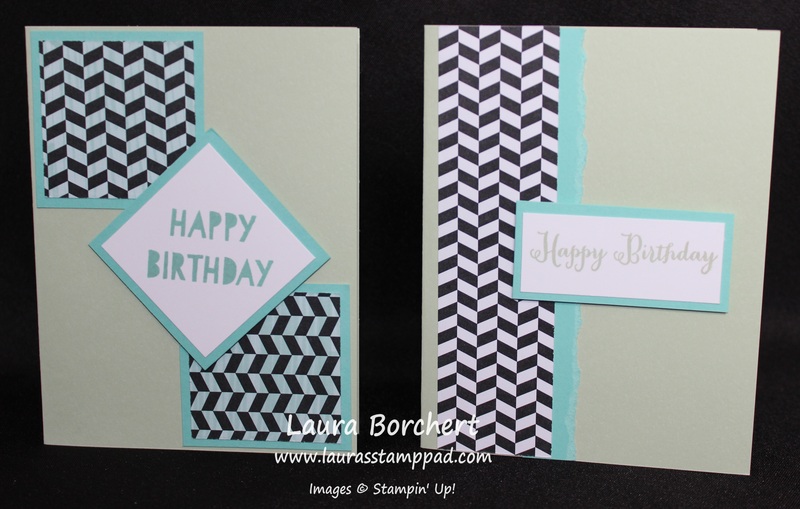 Stamp your greeting to the top of the white rectangle and then add Stampin’ Dimensionals to the corners of your white rectangle. You can add maybe 1 or 2 in the middle if you like them a lot like me! Place that on your card front. 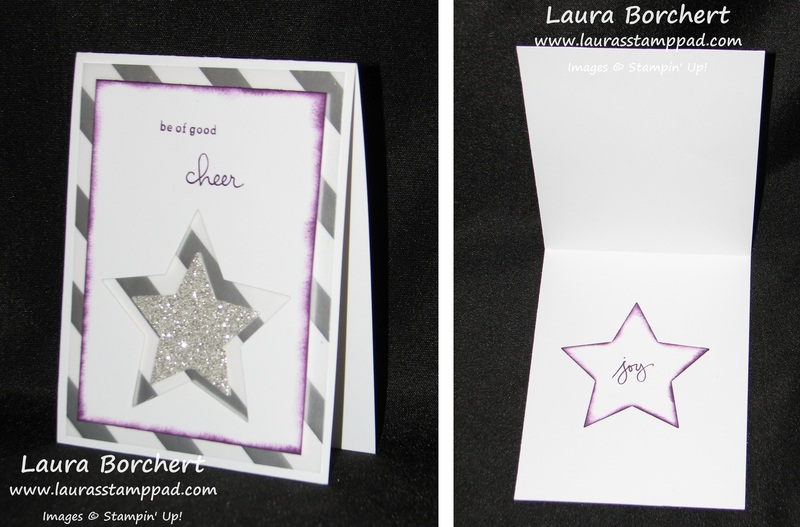 Now using the 2nd smallest Star Framelit, cut out a star in Silver Glimmer Paper! 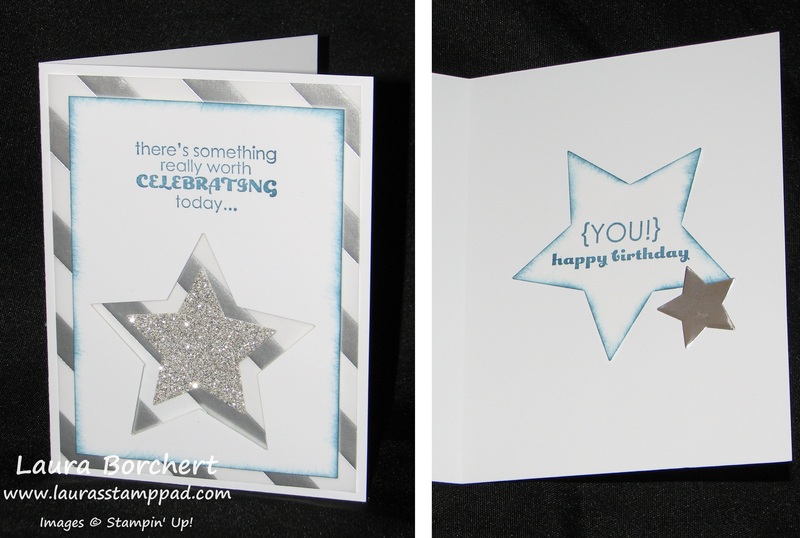 You will adhere this star in the center of your cut out star on your card front. Adhere with Snail Adhesive! You can place your cut out white star on the inside of your card! 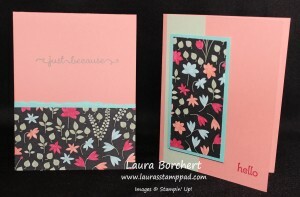 For the card above, I used Blackberry Bliss and the Endless Wishes Stamp Set! For this card, I used Real Red and the Endless Wishes Stamp Set. I added the star to the inside on the top for some extra flare! For this card, I used Pacific Point and the Remembering Your Birthday Stamp Set! Also, I added in a little Silver Foil Star from the center of the wreath from last week’s post! To see this all in action, check out the Video Tutorial below! Be sure to give it a Thumbs Up if you liked it!!!! I would like to thank Dawn Griffith for this great idea. She did her’s in all Silver which I loved but I added my flare with the color!!!! Let me know in the comments below which color your favorite was or which color you would like to use for a POP of color!